Nobody ever speculated on what would end Peter Brock’s life. But one thing we all knew for certain was that it wouldn’t be a car crash. We were wrong. At about 1:50pm (EST) on September 8, 2006, 61-year-old Peter Brock’s life came to an abrupt end when the Daytona Coupe he was driving in the Targa West tarmac rally event near Perth, left the road and slammed sideways into a tree. Co-driver and good friend Mick Hone was to spend a considerable time in hospital, but largely healed. Brock, however, is believed to have died almost instantly. Hone (who pointed out he always felt secure with Brock at the wheel) ultimately concluded in an interview soon after that their number was simply up that day. A metre or two either way and the result would have been very different. Nothing will alter the effect Peter Brock had on millions of people, not all (or even most) of them motor-racing fans. 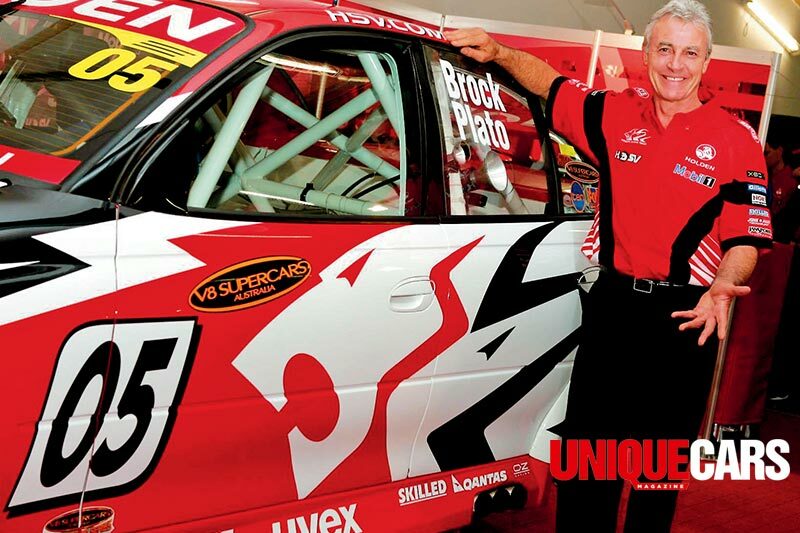 The Peter Brock story began in 1945. Born into a working class family, Brock’s first home was at Hurstbridge, then a village, now a suburb, north of Melbourne. And it didn’t take long for Brock’s natural abilities as a car designer to emerge. Having a mechanic for a father obviously helped, but even more amazing was young Peter’s natural abilities behind the wheel. Early home-video footage shows a very young Brockie jumping aboard a cut-down chassis belching blue smoke and blasting off like he’d been driving for years. But beyond even those attributes was a competitive spirit which Brock would later attribute to his mother who had been a Victorian state tennis champion. Add it all up and the path to a career in motorsport hardly seems surprising. There was, however, the question of money. Basically, there wasn’t much to go round and while Brock senior took Peter to race meetings as a spectator, when it came to actually acquiring a race-car, some enterprise was required. Which is how Brock’s first race-car came to be the now-famous blue and yellow Austin A30 which Peter and a few mates cobbled together in the chook shed at Hurstbridge. But by the time the lads were finished, there wasn’t a whole lot of Austin left and the thing had sprouted huge flared guards, wider track and a Holden 179ci engine. The Brock special first turned a wheel in anger at the Winton circuit in Victoria in 1967. Even Brock would later admit that it wasn’t much of a car but that it "... got me racing, it got me on the track and it got me noticed by the people that counted". Specifically, it got him noticed by Harry Firth, Holden Dealer Team manager and a master tactician and talent spotter. 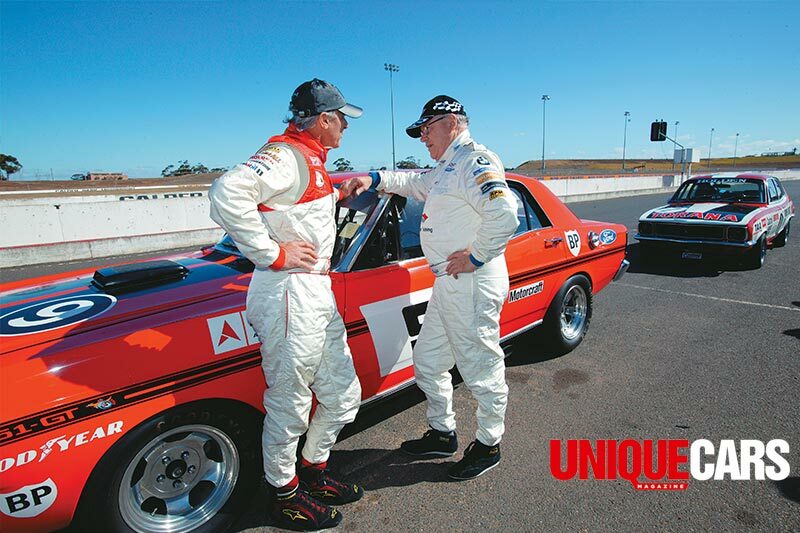 So, while still in his early 20s, Brock was suddenly thrust into the big time with a factory drive for the Dealer Team in a Monaro GTS 350 on hallowed turf: Bathurst’s Mount Panorama. Teamed up with Des West, Brock finished the 1969 Bathurst classic in third place. As a first-up effort it was very impressive. But more, much more, was to come. These days, Brock’s Bathurst haul is well known: a record nine wins – a tally that seems destined never to be beaten. His first win came in 1972 in a Torana XU1 which he drove single-handedly (the rules in those days allowed for a single driver to complete the whole distance). There followed wins in 1975, 1978, 1979, 1980, 1982, 1983, 1984 and finally in 1987. That last win was probably the least satisfying as it was confirmed weeks after the actual event and not before the two Ford Sierras that finished one-two had been disqualified for bodywork discrepancies. Almost as impressive as his Bathurst record is Brock’s tally at the annual Sandown long-distance race, the traditional precursor to Bathurst. Brock was just as dominant at Sandown, winning the race nine times starting in 1973, claiming seven on the trot between 1975 and 1981 and finally in 1989. Australian Touring Car Championships? Yep, three of those, in 1974, 1978 and 1980. It was probably in the late-’70s and early-’80s that Brock was most dominant in his sport. As well as local and international events (the Le Mans 24-hour race just for starters) he also drove the winning car in the Repco Round Australia trial event in which Commodores filled the first three places. He was also all but unbeatable at Bathurst in those days, including rubbing everybody’s nose in it in 1979 by winning by more than six laps and setting a new race-lap record on the very last lap just to drive home the point. Think about that: Having the sheer balls to risk it all on the last lap to make a point. For all that, there’s no temptation to accuse Brock of grandstanding or acting impetuously. He simply knew he could pull off such a stunt and then did so. Such a steely belief in himself became a Brock trademark as was his assertion, in later years, that: With our thoughts, we create our world. His serenity suggested a deep inner peace and it was true that Brock’s spirituality became a huge influence on him in later years. He turned to meditation, believed passionately in the power of positive thought and even became a strict vegetarian. But serenity wasn’t always a by-word for Brock’s off-track life in the early days. In the 1970s, his consumption of strong cups of tea and full-strength Marlboros was, if not legendary, at least a bit of a talking point in the pits. But as the years passed, Brock realised that physical condition was an integral part of being a successful race driver, and he gave up the fags and turned to a healthy diet. Less easy to control were his relationships. Brock’s first marriage (and it’s a little-publicised one) was in 1967 when he married Heather Russell. But by Brock’s own admission, the dual roles of married man and racing driver just didn’t gel and the marriage ended in divorce two years later. Round two came in 1974 when he wed former Miss Australia and Channel 7 weather girl Michelle Downes. This was an even briefer encounter, lasting just a year and, depending on who you talk to, was a difficult relationship from the start. Brock’s third wife was Bev McIntosh, arguably his soul mate and a woman he would partner for almost three decades. Although they never officially married, Bev took his name and they had three children together. But in 2005, even that fell apart and Peter and Bev split, allegedly amicably. Shortly after, Brock was interviewed on television by Andrew Denton, who asked about Bev’s recently published book about their life together. Questioned about the content, Brock had to admit that he hadn’t read the book. Perhaps that’s just as well because among other revelations, the book contained suggestions that Peter had been carrying on an affair with a family friend for as many as 15 years. Some time later, Peter announced that he had a new partner, Julie Bamford, who was in Perth on the day of the tragic crash. Even now, controversy dogged Peter’s relationships with Julie’s former husband claiming in the press that he had broken Brock’s nose and that Peter had stolen his wife and the mother of his two children. Away from his private life and the race-track, Brock proved that he was an astute businessman. In 1980, he recognised that there were runs to be scored by linking his own racing success with a range of road cars. The Brock Commodore was born. The first prototype, a blue VC model, was nothing to look at but went hard and was the blueprint for more visually exciting cars that shared the mechanical enhancements of that first car. The first Brock production facility was in North Melbourne but the operation soon outgrew that factory and was moved to Port Melbourne. At its peak it was cranking out thousands of modified Commodores to an eager public who valued the Brock signature on the air cleaner as much as the performance itself. Brock was on a roll and, clearly looking for explanations to the bigger questions, began to examine the meaning of life. And that was the point at which Brock the businessman and Brock the new-ager tangled. In partnership with chiropractor Dr Eric Dowker (soon to become known off the record as ‘Brock’s guru’) the Brock Organisation (as it was then known) developed the infamous energy polarizer. On a warm February night in 1987, in a swish reception centre in a posh Melbourne suburb, Brock, dressed in a dinner suit, along with Eric Dowker, ceremoniously pulled the drapes off the Brock Director, a big-dollar Commodore-based car with outrageous bodywork and, of course, a polarizer. Holden reacted swiftly and decisively: Brock, the company’s favourite son for so long, was disowned and his car-building empire effectively cut off at the knees. The unthinkable had happened. In the years that immediately followed, Brock turned to racing everything from BMWs to Volvos and even Fords. His car building interests shrunk and turned to modifying, of all things, the Lada Samara, a wretched little Russian-built hatchback with appalling build quality and hopeless performance. Gifted though he was, not even Brock could turn a Lada Samara into anything worthy. The rift was relatively short-lived, though, and by 1994, Brock had put the polarizer on permanent hold and had pulled off a classic prodigal son move with Holden. From there, the Brock legend simply began to skyrocket. He was soon the most bankable Aussie male personality you could think of and suddenly his years of championing a variety of road safety campaigns and his abilities as a people person had come home to roost. By now Brock’s influence had gone way beyond motoring. He also involved himself in such diverse activities as appearing in TV advertising campaigns, being front man for various charitable organisations including his own Peter Brock Foundation which was involved in supporting community programs aimed at helping disadvantaged young people. He also worked as athlete liaison for the Australian Olympic team at Athens, the first time a non-Olympian had been appointed to this role. It’s a mark of his impact that, even now, a decade after his passing, a full-blown television biopic is to be launched. And you can bet that, like his life, it will be the subject of rumour, speculation and the odd hot debate over a cold drink. See Unique Cars magazine number 392 (Sept 1, 2016) for a full tribute to the man and his cars. Some serious metal shifted hands at Shannons Sydney Winter Classic Auction on the 10th August.